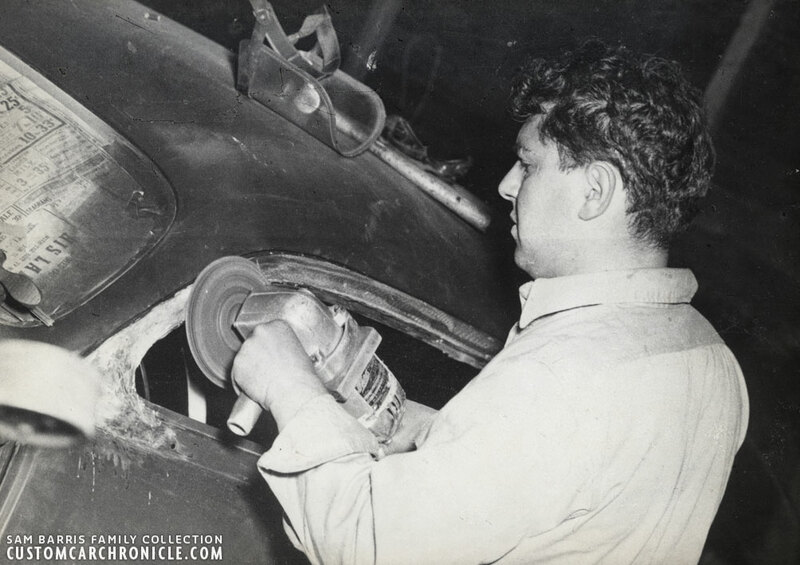 Part three in the series on the Chopping the top on Jerry Quesnels 1949 Mercury by Sam Barris. 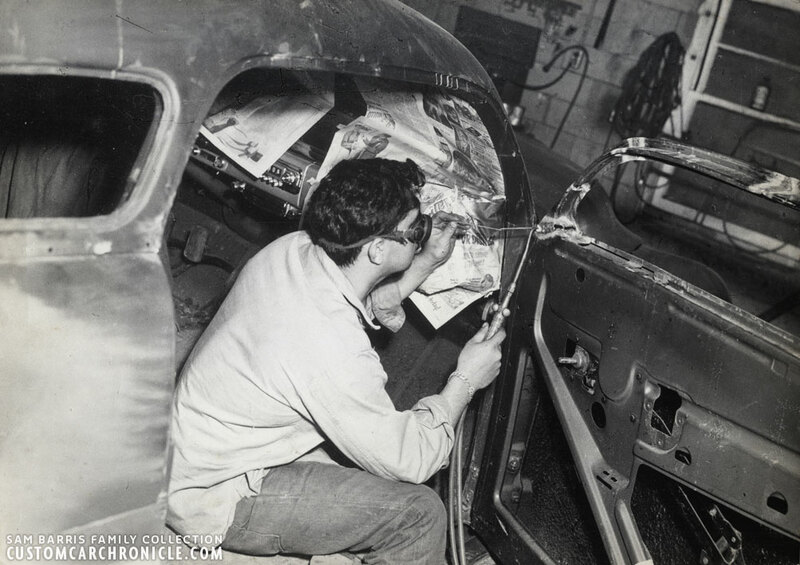 Finishing the Mercury in white primer, and showing it at the Montebello Tent Show in 1951. 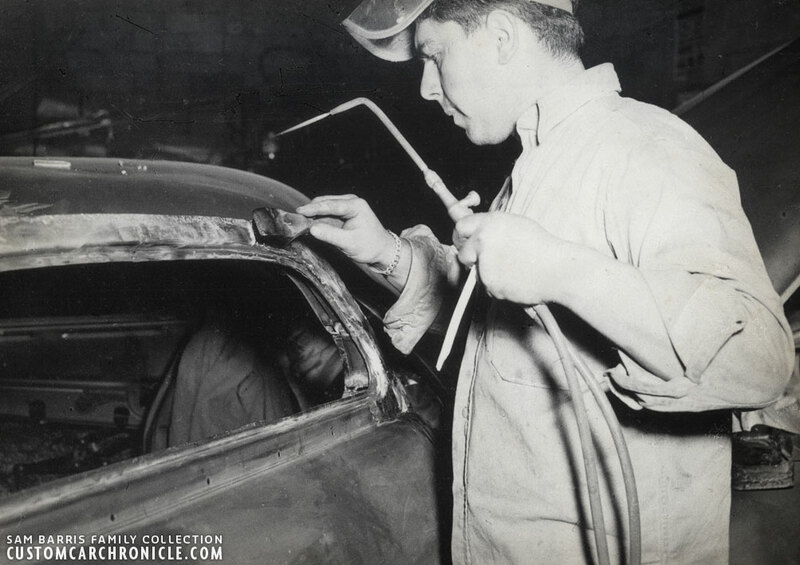 In this third and last part on the Marcia Campbell created photo album of Sam Barris chopping Jerry Quesnel’s ’49 Mercury we will show how Sam reshaped the door frames, and how the car left the Barris Shop in white primer. 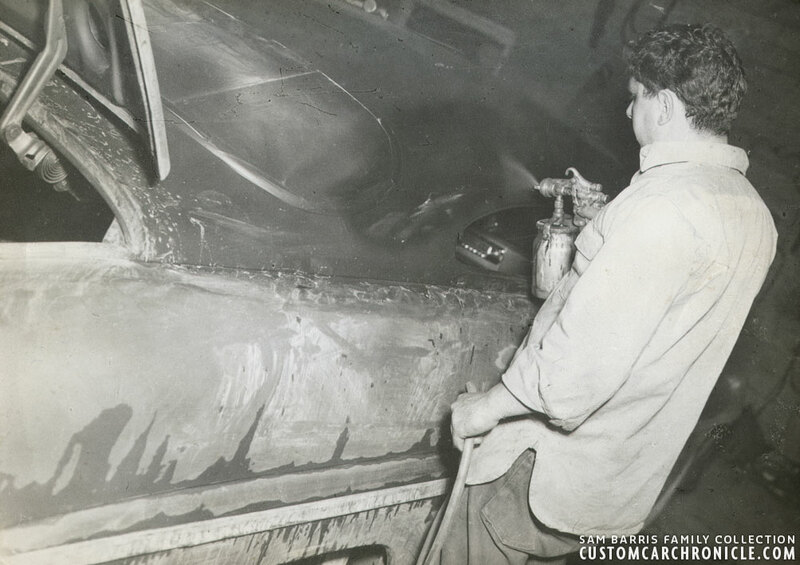 Jerry Quesnel was a part time employee at the Barris Shop at the time his 1949 Mercury was built. 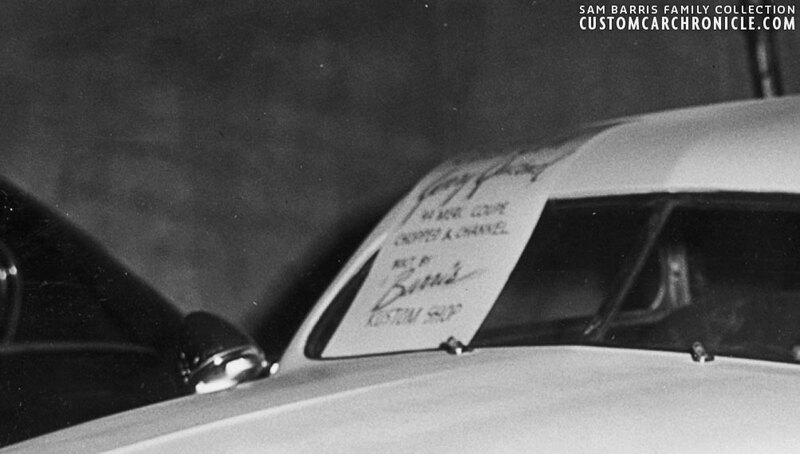 We do not know if he had his car done as a client, or if he possibly did a deal with Sam Barris trading work. 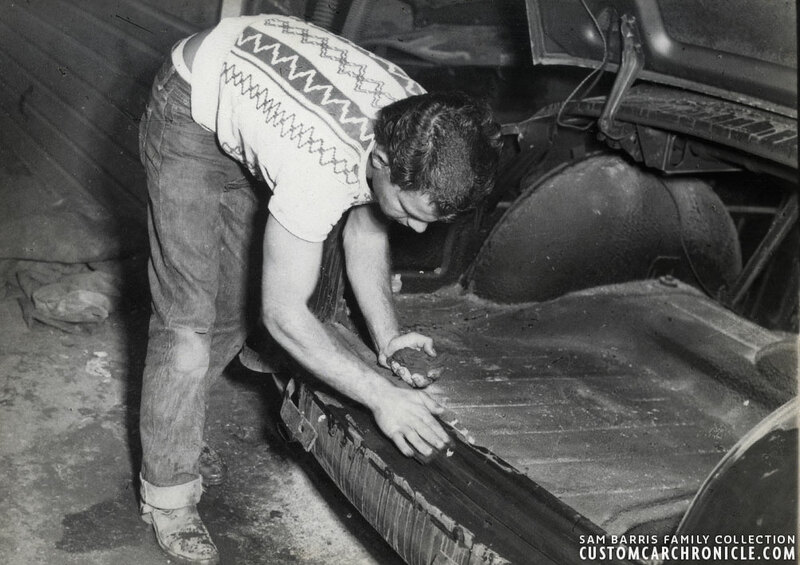 We know for many stories that a lot of work was traded back in the day, especially among the guys who worked in the Barris Shop. Perhaps Sam agreed to chop the top on Jerry’s car in trade for Jerry helping him out on his own personal Mercury. Sam created the door window frames and now all the hard metal work has been done. In the background we can see most likely the Snooky Janich 1941 Ford on the left, and peaking thru the windshield and just behind the trunk of Jerry’s merc we can see the Jack Stewart Ford again. Notice that Jerry’s Mercury already had a set of Appleton Spotlights previously installed. With all the lead sanded smooth it was time to push the car back inside. All the lead dust covers the trunk and roof, and of coarse found its way into Sam’s lungs as well. 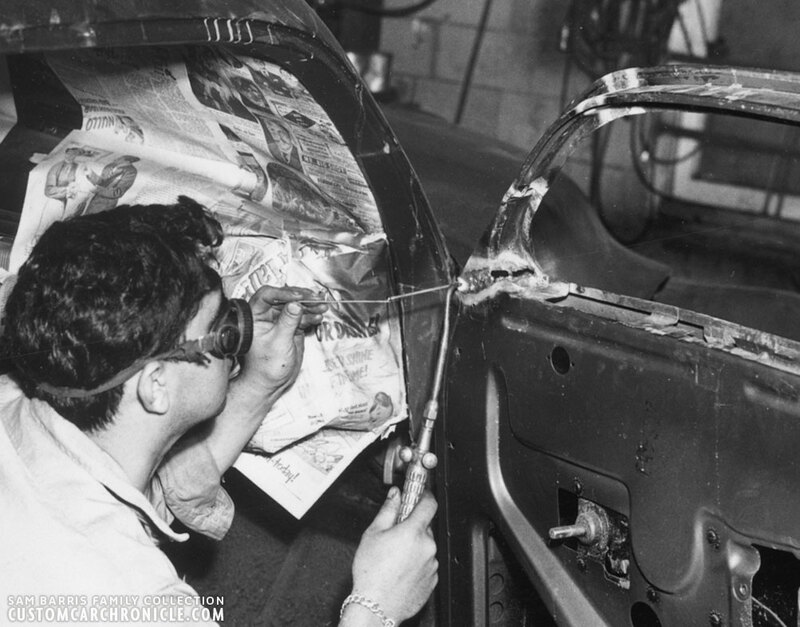 Sam Barris sitting inside the car working on the front corner of the door frame. Notice how much reshaped the rear portion of the door frame is. The work done on the roof and B-pillar has been covered with dark primer as we can see in this photo. I have enlarged a section of the photo above to show a little better how Sam is welding up the cut he had to make to lean the side window frame inwards at the top, to match the new lines of the chopped windshield frame. New window frames with completely reshaped rear sections to match those on the front. The roof and A-Pillars have now been covered in primer. Oddly enough the windshield has been filled with cut down glass. Possibly Jerry needed the car to be drivable during this stage? Close up from the back shows how much cutting and welding was needed to make this window frame with the needed shape. Sam adding lead to the door frame, holding the wood peddle in his right hand, and the torch and lead-stick in his left hand. Sanding down the lead, smoothing everything for primer. Door frames all done, looking fantastic and ready for primer. Look at all the lead sanding dust on the car. Adding more primer to the roof. Notice that the rear window has been installed again at this point as well. Sam Barris wet sanding the roof to get everything as smooth as possible before the final primer coat (white primer) will be added. Sanding the rest of the body. 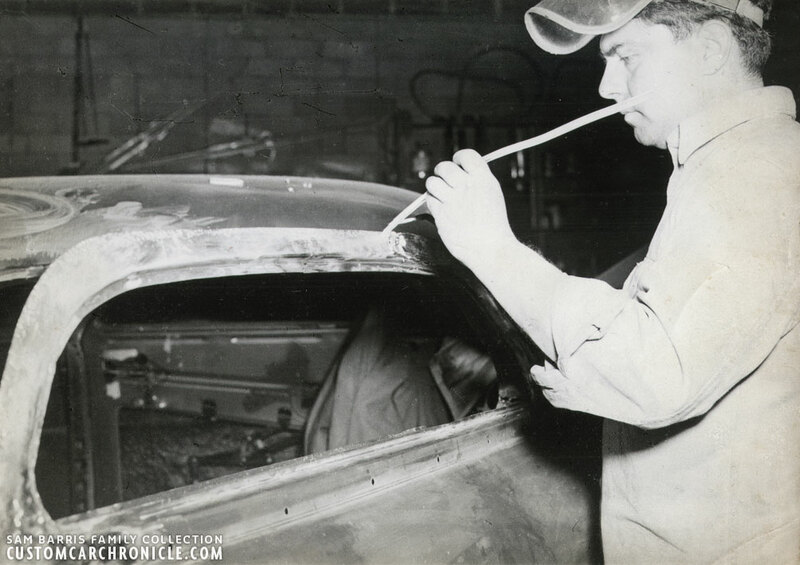 Unsure if this is Jerry, or somebody else helping out at the Barris Shop. It also appears that Jerry used an hubcap in the trunk to make some extra space for the rear axle center piece, just as was done on the Sam barris Mercury (thanks for pointing that out Kenny). 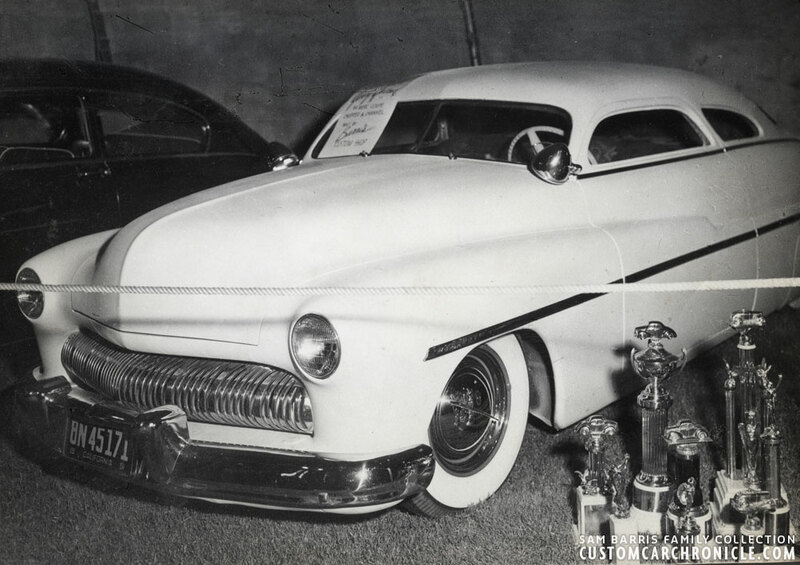 The last photo in the album shows Jerry’s Mercury “finished” in white primer at the Montebello Tent Show in 1951. Note that the car did not have windshield wipers, no stainless trim around the side windows and no vent windows installed yet. Interesting is that the car still had its stock ’49 Mercury grille (sans center piece) and dressed up with single bar flipper hubcaps, which were perhaps a bit outdated in 1951, especially on such a new car. 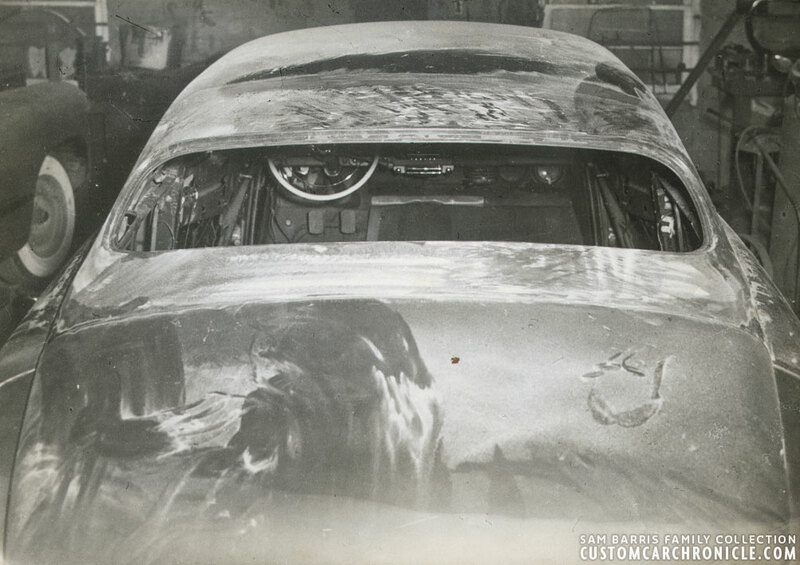 There are two more known photos of Jerry’s ’49 Mercury in white primer as the “White Ghost” at the Barris Kustom Shop. Unsure is if Marcia also took these photos and if they at one time have been part of the album or not. 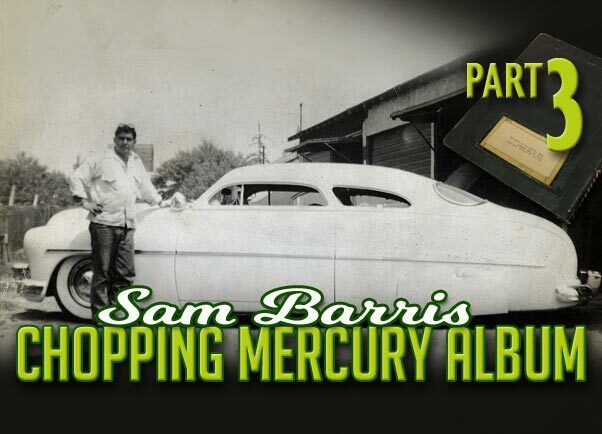 One of the photos, where Sam Barris stands with the Mercury in his typical Sam Barris pose we can see that the car now has vent windows, or at least the vertical bars installe. 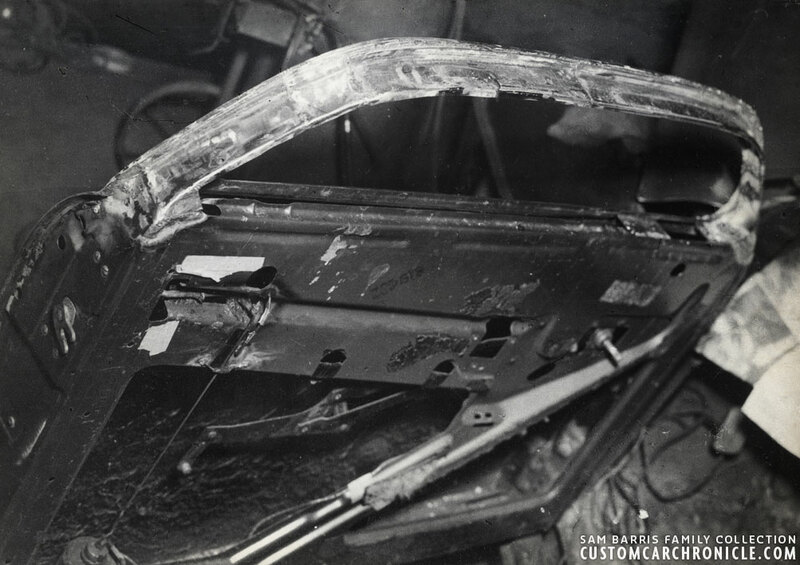 But it still appears that there are no rear quarter windows, nor stainless surrounds on all side windows. I have included them in this article since I feel that one, and perhaps both photos are still part of the whole series. The lack of fender mounted taillights makes Jerry’s Mercury look extremely slippery from the rear. This photo shows that the roof towards rear window flow is actually very nice. 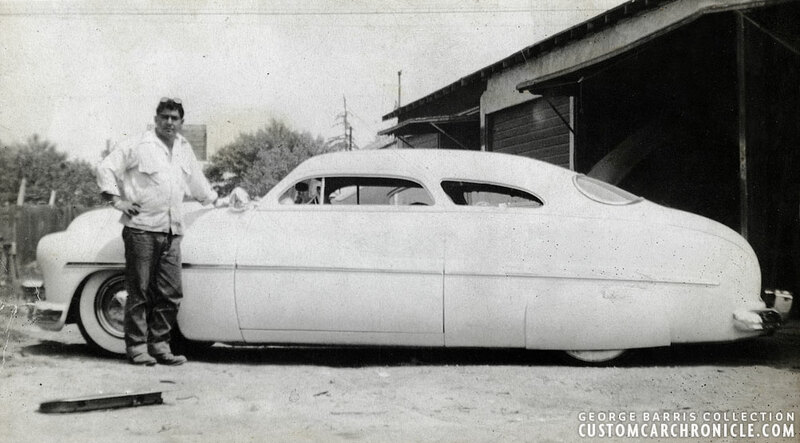 Sam Barris posing with the freshly finished – white primer version – Jerry Quesnel ’49 Mercury. This photo shows the car with the vertical bars for the vent windows installed. This photo might have possibly been taken after the Montebello tent show. 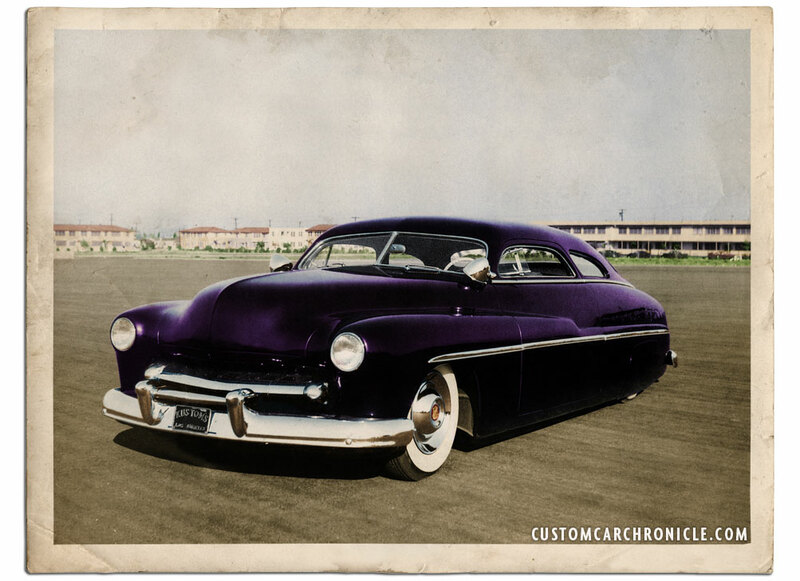 Jerry Quesnel’s ’49 Mercury would later be finished with a custom grille created from ’51 Ford grille components, Cadillac Sombrero hubcaps and painted deep purple. The front section of the side trim has now also been replace with a rear section for a more subtile look. I have enlarges two sections of the last photo in the album that provide us with a bit more informations. And I have noticed that Sam can be seen in this series of photos wearing four different shirts. I have no idea what that means, of Sam wore a different “work” shirt every day, and that it means that the work is spread out over at least four days. I have added the different shirts here anyway. Perhaps one day it will help solve any other loose ends in the time frame of this album and or the chopping of the first ’49 Mercury. 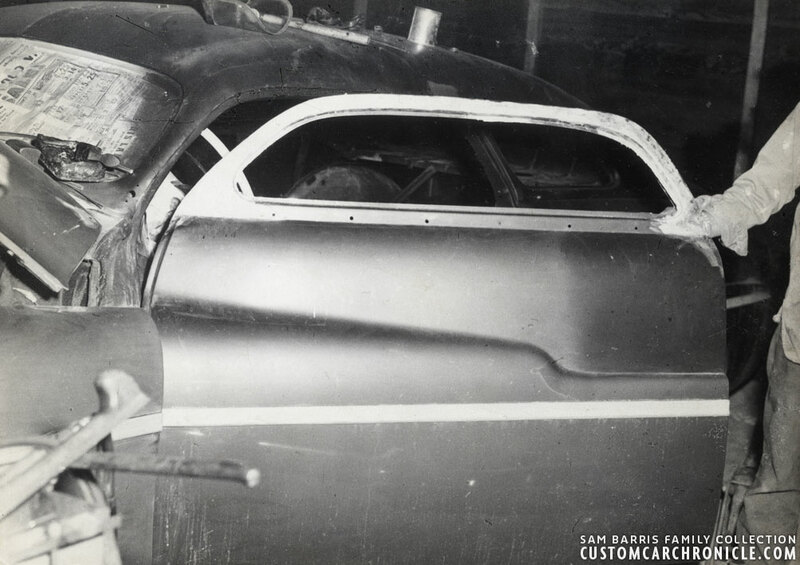 The sign on the windshield reads (at least the part we can read, something more is on the top, which we cannot see good enough): Jerry Quesnel – 49 Merc Coupe Chopped & Channel – Work by – Barris Kustom Shop. Notice the lack of windshield wipers. There are many trophies placed to the car in Marcia’s photo. We do not know if these trophies actually belonged with the Jerry Quesnel Mercury, or with the Cliff Rackohn’s ’47 Mercury parked next to it. With Jerry’s Mercury only freshly finished and still without the vent windows and side window moldings it might seam odd it already had won so many trophies. 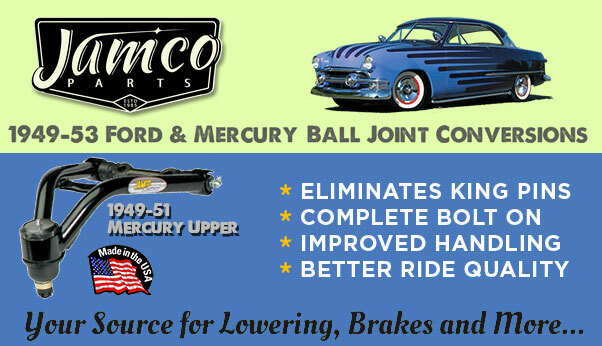 But since Jerry’s Mercury is most likely the first ’49 Mercury to get chopped, that might have helped win some trophies. 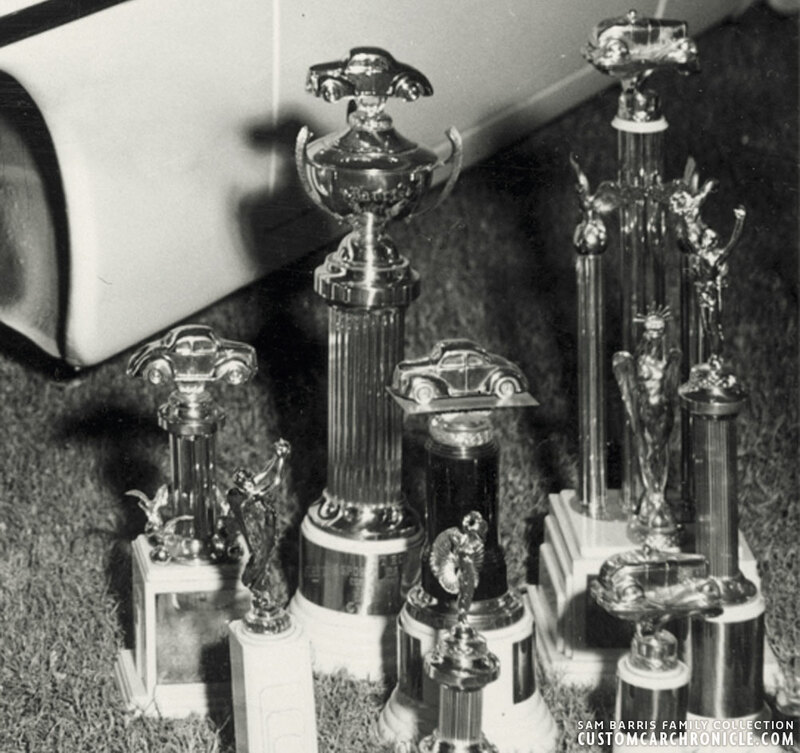 Also we do know that George Barris used to carry a lot of trophies to the shows just to display with the Barris cars on display. Of course a marketing way for gathering more attention to the cars, and the Barris Kustom Shop. 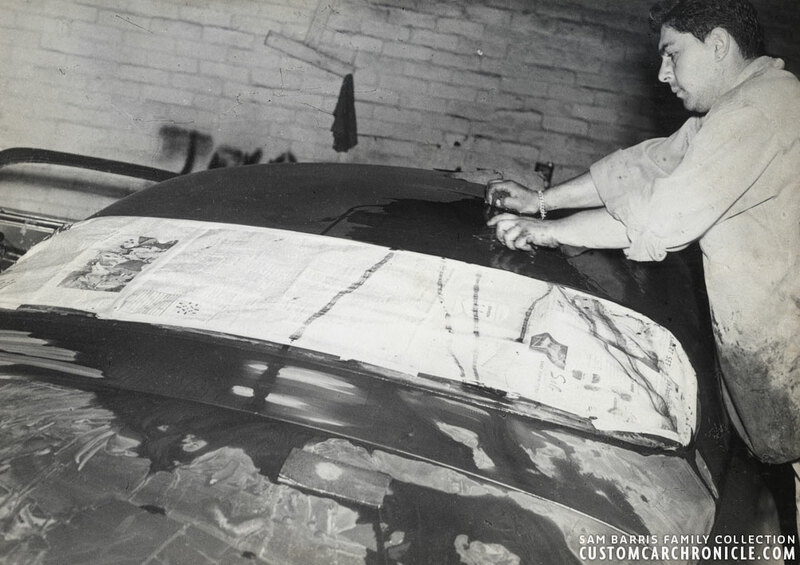 Sam wore four different shirts during the process of chopping Jerry’s ’49 Mercury. Or at least Marcia Campbell captured Sam wearing four shirts. We do not know how long the whole process of the chop took, nor if Marcia was present from start till Finnish for the whole duration. 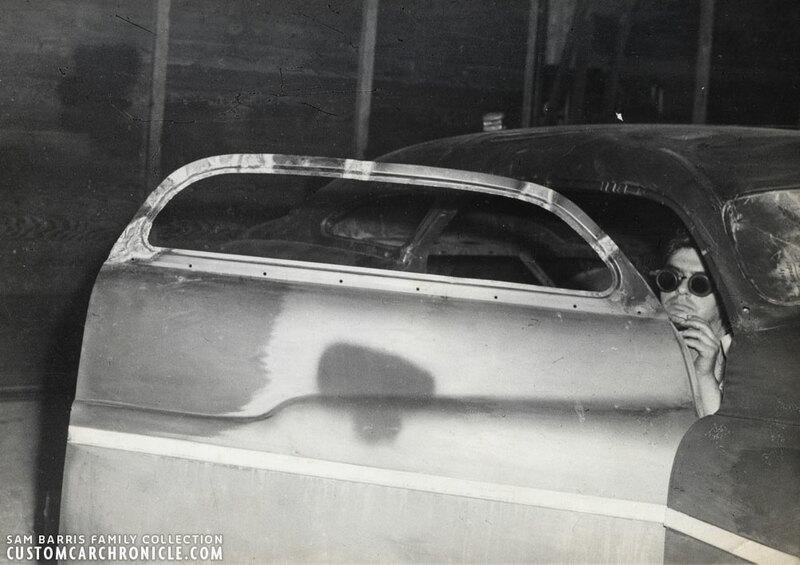 The last photo of the album, where we can see Jerry’s Mercury in white primer was taken at the – what we know as the – Montebello Tent Show in 1951. 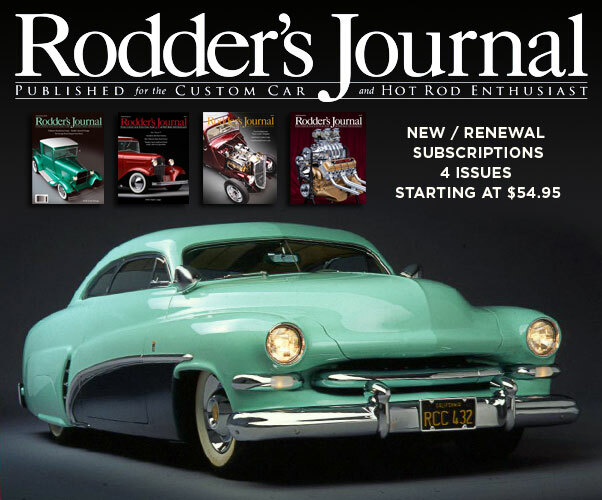 The Rodder’s Journal did an small article about this one weekend only car show held in one, or multiple tents in the RJ#49. A series of photos taken by Jerry Chesebrough and part of the Ron Kellogg Collection were showed in this article. 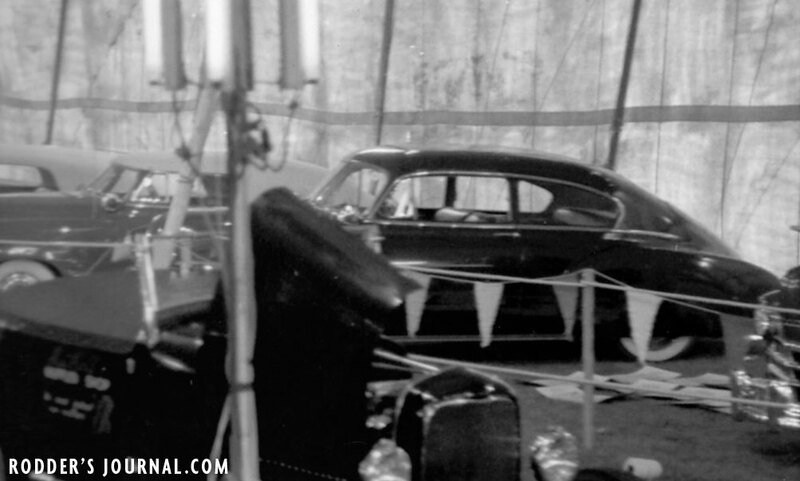 The Tent Show as said to be held at the old Montebello, California armory, and one of the photo taken outside show at least two tents. Inside one of these tens a line up of mostly Barris Customs was set up and Jerry Quesnel’s freshly white primered ’49 Mercury appeared at this event. There has been some controversy about if Jerry’s Mercury was actually photographed by Marcia at this particular Montebello show, or possibly a different show. 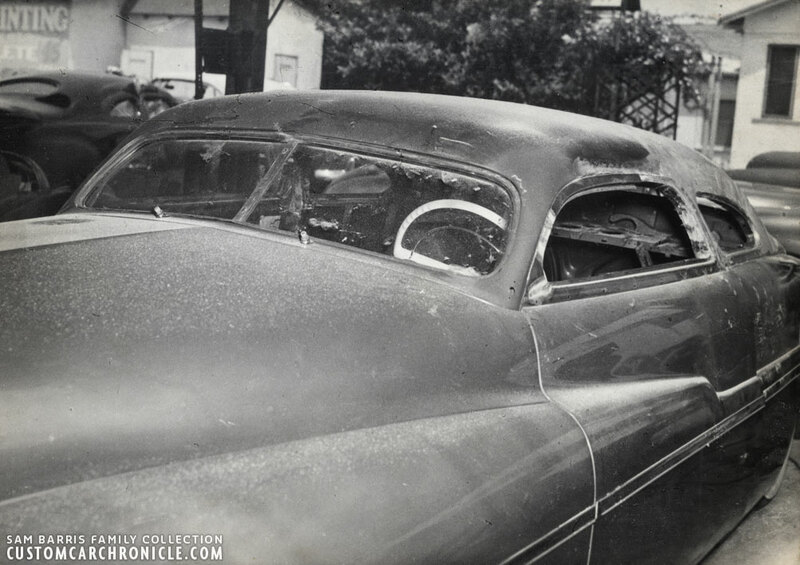 A heated discussion about this was held on the HAMB several years ago, and was based mostly about the absence of the light colored piping on the interior of the Chevy Fleetline parked next to Jerry’s Mercury in Marcia’s photo. The piping seamed to be missing in the Chesebrough photos. However different ways of taking photos – Marcia with a flash, versus Chesebrough with long exposure on a try-pod – can explain this difference. Especially since all other details, as tent shapes, poles, and especially other cars and empty spot in the pictures seem to match and place Jerry’s Mercury at this Montebello show. 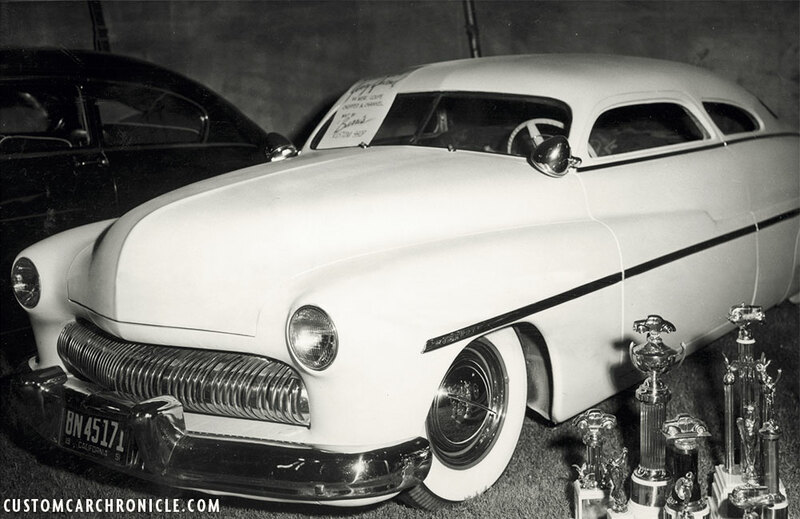 Fortunately Hop Up magazine recently published another photo from this same Tent show from yet another angle, and id did show – although one have to look very carfully – Jerry’s parked next to Cliff Rackohn’s Barris Kustoms restyled ’47 Mercury. Sadly we do not have any show dates for this show, which would help dating all this even more. 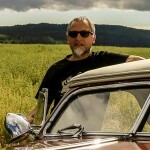 Custom Car enthusiast Jeff Neppl has spend many hours trying to find any more info on the Montebello show, but so far no additional info has been found. Jeff also talked to Jerry Quesnel about this show, but not much new info has come out of that, other than Jerry confirming he was at this same tent show. This photo shows Gil Ayala’s 42-46 Ford Coupe in the front, Gordon’s 49 Chevy on the far right and Cliff Rackohn’s 47 Mercury in the center. There clearly is an empty spot between these two cars, where the easel is standing, possibly from the sign writer who created hand made car signs at the show. Next to Cliff’s ’47 Mercury we can see Snooky Janich ’41 Ford, Nick Matranga ’40 Mercury, Jesse Lopez ’41 Ford and not showing in this picture is Jack Stewart ’41 Fordparked next to Jesse’s Ford. 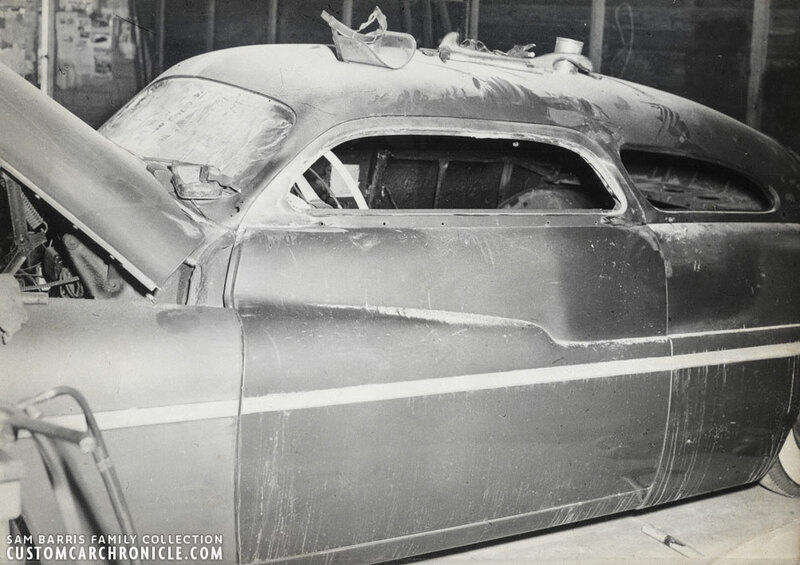 Facing the other way we can see Gordon Anderson’s Barris restyled ’49 Chevy Fleetline, which we also can see in the Marcia Campbell photo of Jerry’s ’49 Mercury. And we can also see the possible signs on the grass on the empty spot between Gordon’s Chevy and Cliff’s Mercury. The spot were later Jerry’s merc would be parked. Another photo from the 1951 Tent show has appeared in Hop Up magazine. 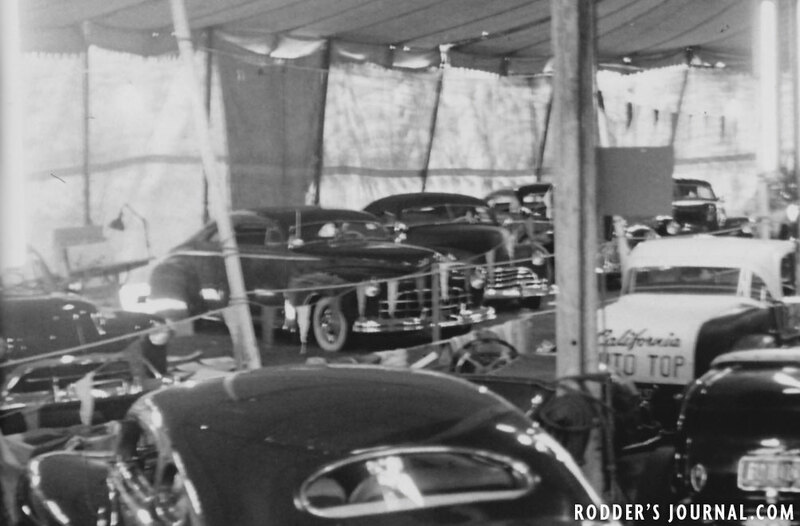 In this photo we can see an amazing line up of the mid 40’s Barris Customs lined up at the edge of the tent. On the far right the 47 Mercury of Cliff Rackohn, sadly cropped off in the front. 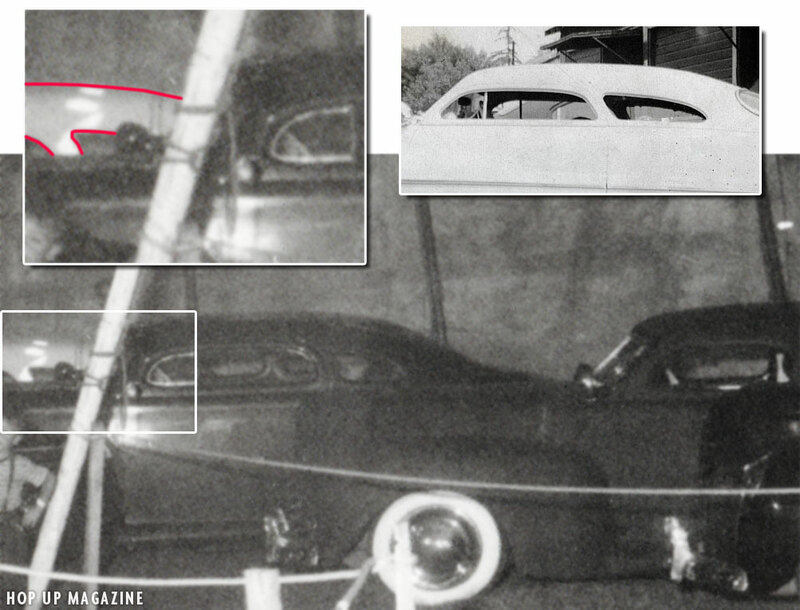 But this photo does show a small section of Jerry’s ’49 Mercury parked next to Cliff’s ’47 Mercury. 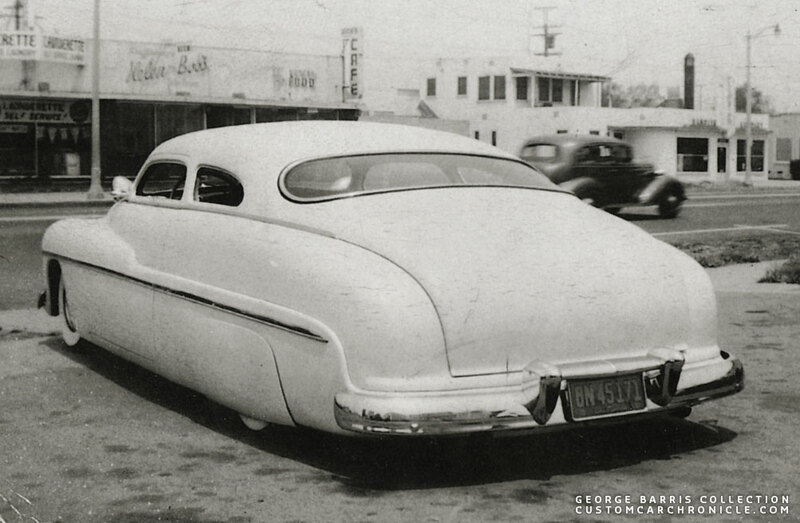 It shoes enough of the car parked in the back to clearly see the very distinctive forward angled b-pillar and rear quarter window shape on the white primered Mercury from Jerry Quesnel. This photo proofs the Jerry Quesnel Mercury was at the same Montebello Tent Car show in 1951. Also notice the similarities in the shape of the B-pillars on Ciff’s ’47 Mercury and Jerry’s ’49 Mercury. To show the car a little better, nicer, I have digitally removed the rope from this photos. Special thanks to Marcia Campbell, Sam Barris, Jerry Quesnel, John Barris, Rob Radcliffe, Curtis Leipold, and Jeff Neppl. Thanks for a great look back in time Rik. This album allows us a peek at the creative process involved with what was a first of it’s kind chop. Maybe that’s why Miss Campbell decided to document it all. Yes !!!!!!!! First time I have ever seen this Hop-up photo. It feels good to have validation and proof that all my hours of research weren’t wasted on this. This really is great news. Rik, this 3 part article is probably the best custom reading I have read. Awesome work again Rik. I wonder why this new pic was never brought to my attention from any of the Hop-up guys or anyone who knows about our debate about this year’s ago on the hamb. Oh well it’s out now and I’m sure they are holding onto plenty more photos. Thanks for this article Rik. Rik, thanks for that super zoom on the new released photo. Just terrific, Rik….you did it, again…..STILL. I just came back to this to again check out the great pics, only to discover I neglected to hit the “submit” button for the really swell(!) comment I wrote before! So, I will just say I agree with all that the other fellows have said here and to thank you for your (and all the others involved) continued research on my absolute favourite Merc (in it’s “ghost” livery).